Playing this music on the modern Irish harp is not problem-free. The left hand has to execute lever changes at great speed while the right hand takes over any notes which a keyboard player would play with both hands; this is why the development of the semitone mechanism on the instrument has been cruical. Moreover, the resonance during characteristic harmonic changes require certain speeds most suited to the Irish harp, although this might vary where other instruments are concerned. Not only are some of Bach's manuscripts unspecified about speeds, but he himself was sometimes open-ended about which instrument might be used. A variety of preludes are therefore featured on this recording because their textures, colours and patterns lend themselves so successfully to the Irish harp. Since contrapuntal writing is less suited to the instrument, these preludes have been chosen to highlight the harp's timbres, as reflected in the different instrumental range of pieces conceived originally for cello, lute or baroque keyboard. This recording also features two sets of chorale variations by Ann-Marie O'Farrell,which are structurally in Bach's musical theological lineage. This lively opening to Bach's Lute Suite in E is derived from his Violin Partita in E for solo violin. To achive the best resonances on the harp, it has been transposed down to the key of Eb. Interestingly, the harp has occasionally been suggested by scholars as a possible original instrument for Bach's keyboard manuscript of this piece. Like so much of Bach's writing for cello, this piece is both chordal and melodic while highlighting the seldom-heard depth of the Irish harp. To maximise the bass clarity, this movement has been transposed up a semitone to Ab major. Bach's first prelude of the 48 Preludes and Fugues forms the accompaniment to a lyrical melody which was later added by Charles Gounod (1818-1893). This was first published as an instrumental piece in 1853 for cello or violin withpiano or organ, and only one year later emerged as the well-known vocal work it is today. Written for keyboard instruments of the baroque era, this toccata uses the typical range of the Irish harp, showing its depth as well as the brighter timbre at the top of the instrument. It is from Bach's most famous keyboard collection in two volumes, Das Wohltemperirte Clavier, which remained unpublished during his lifetime, and was not available in complete editions until the early 1800s. This is from a set of two works illustrating the French and Italian styles, published in the Clavier-Ubung Part 2 in 1735. Its beautifully shaped melody resembles an arioso in the florid Italianate style, typical of solo concertos of the time. Bach loved to write for the newest instruments of his time and wrote the last of his cello suites for a five-string instrument. The addition of a higher E string brings the range of this movement towards the middle of the Irish harp's register. Like much of his other cello writing, the chordal elements transcribe most characteristically to the Irish harp and the use of harmonics for repeated notes exploit the harp's possibilities. For optimal resonance, the piece has been transposed down a semitone to Eb major. The recurring dotted rhythm in 6/8 time gives this, gentle movement its character. The work is possibly derived from a trio sonata by flautist J.J.Quantz (1697-1773), who is believed to have met Bach at the royal court in Dresden. The hymn tune used here is attributed to Mozart and is set to a most attractive text by Frances Ridley Havergal,published in the Church of Ireland Hymnal. These variations are in Mozartian style and commemorate the 250th anniversary of his birth. They explore colourful and textural possibilities on the Irish Harp within a classical style. The original key of Eb major for this arpeggio prelude is ideally suited to the Irish harp, while many enharmonics are used later in the movement to accommodate more remote change of key. The sustained semiquaver movement in both hands combine with key change makes considerable demands on the harp's lever mechanism. An earlier, shorter version in Bach's Clavierbuchlein was used by him in the musical instruction of his son, Wilhelm Friedmann. This is a setting of the chorale movement in the cantata, Herz und Mund und Tat und Leben. Much of Bach's music was inspired by Lutheran theology and the original German text of this piece expresses Bach's Lutheran emphasis on faith. The key of Bb minor is an example of Bach's innovative inclusion of keys avoided by his predecessors. In Das Wohltemperirte Clavier he sets out to establish an instrumental tuning which would allow for the equal use of all 24 keys. It is appropriate to mark the development of the Irish harp's semitone lever by performing such movements here. This lively dance in 6/8 was published as part of a suite of dances in 1726 and is from the first of his four Clavier-Ubung collections. This was written as a gift for Rev. Ted Woods to celebrate 40 years of ordained ministry and explores harmonies and scales used by Gavin Bryars and Oliver Messaien. The simplicitiy of the original 18th century hymn tune by J.B. Konig (and later adapted by W.H.Havergal) gave much scope for variation. Both the melody and text are published in the Church of Ireland Hymnal. 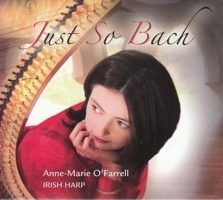 Anne-Marie O'Farrell is the leading exponent of the Irish harp as a recital instrument. Her development of the Irish harp as a concert instrument and her commitment to the expansion of its repertoire has led to performances and recordings for TV and radio throughout Europe, the USA, Scandinavia, Japan and Africa. As a soloist and accompanist she has toured extensively in Europe and the United States, and has performed at numerous international harp festivals including several World Harp Congresses. She is regularly invited to give lecture recitals, workshops and masterclasses at international conferences and festivals. A prolific recording artist, she has previously released several albums, including Heads&Harps, Harping Bach to Carolan, The Jig's Up,My Langan Love and Double Strung with Cormac De Barra. She has also recorded with, among others, The Chieftains,Anuna, Meav Ni Mhaolcatha, Ellen Cranitch and numerous orchestras. In addition to her interpretation of Irish music, Anne-Marie is especially noted for her transcriptions of keyboard, lute and pedal harp repertoire for the Irish harp, and also for her unique levering techniques. As a result of her innovations,she was consultant to Salvi harpmakers on the design of their Irish harp, the Livia. She holds professional diplomas in many instruments along with national awards for original compositions. An honours graduate of UCD, she has been awarded a first class honours MA in composition from the National University of Ireland, Maynooth. In 2006 she was presented with the O'Carolan award by the Vocal Heritage Society of Ireland for her achievements to date. She lectures in stylistic composition at the DIT Conservatory of Music and Drama and teaches the harp at Kylemore College Music Centre (CDVEC) where she has founded a thriving harp department and harp ensemble. As a composer she is represented by Ireland's Contemporary Music Centre. Ray Comiskey, Fionan De Barra, Aisling Drury Byrne, Karin Leitner, Moya Brennan, Barry Regan, Aisling Jarvis, The Victor Salvi Foundation and all at Salvi harps, Ray Hickey, Jonathan Grimes, Eve O'Kelly and all at the Contemporary Music Centre, Helen Davies, Mercedes Garvey and all who have inspired and supported me in any way. A.M.D.G. Ann-Marie plays a 38-string Salvi Livia on all tracks except nos.7 & 11 on which she plays a Salvi Diana.